Even if you are on the right track, you’ll get run over if you just sit there. Anirban (guy giving the presentation) shares his wonderful experience of internship days. I have specialization in Astrophysics and I always look for summer schools and internship programs on astronomy and astrophysics. Luckily, this summer Cotton College State University conducted a summer school on the same. I got to know about that through their website and wrote an email in order to apply. After a week or so, when I saw the selection list, I was delighted. I joined the school after my end semester, and their first class was awesome – right from the formal introduction to the basic knowledge about the subject. They had teachers from NCRA (National Center for Radio Astrophysics), RRI (Raman Research Institute), and TIFR (Tata Institute of Fundamental Research). All the teachers were friendly, motivating and are masters in their field of work. Our classes used to start at 10 a.m, then followed by a break with light snack and cold drinks, as it was very hot. After the break there would be some interactive classes followed by Lunch break and again classes. We even had tutorials on image processing of sky, galaxies, radio astronomy techniques etc. We used to talk with different research people from all over the world through skype and learned a lot from their work and experience. During tutorials we were worked on IRAF, to measure the flux from a supernova remnant, and we also had classes on photometry. Sometime we used to sit in galleries or canteen and had interactive sessions with the teachers and research people and discussed all the questions that popped up during the day long lectures. We visited Planetarium and enjoyed a very nice show on “life beyond earth”. We also had the privilege of being amateur astronomers and looked through the night sky with a telescope and even located some sun spots. We had loads of photo sessions and even watched documentaries which were very fascinating. On our last day we were asked to present a seminar. I gave a seminar on Supernova and it was a great experience to present such a huge thing in front of the experts. The seminar was followed by some question answer sessions and we learned a lot from them (how to present a seminar, maintaining posture while delivering the matter). We celebrated the last day with cake, snacks and also felicitated our teachers. We got our certificates from the Vice Chancellor of the University and best wishes to carry forward our journey on this subject. This was my story about my first summer school and I really look forward to attending more of them in the future. I really hope that all the students will attend such schools and internship programs, not for the stipend or a vacation outside their hometowns but to learn something from the great minds of our country. 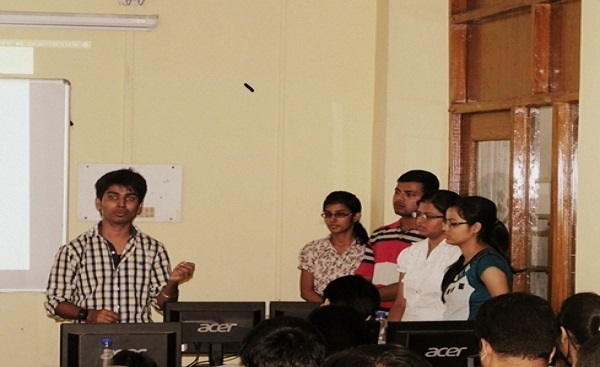 If Anirban’s experience motivates you, you can check the latest internships in Guwahati.